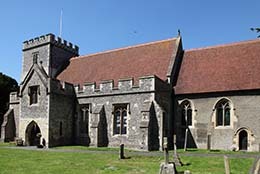 The church has arcades from the 13th and 14th centuries, with other original 14th century features including the clerestory windows and splendid chancel fittings of Sedilia, Piscina and Easter Sepulchre. 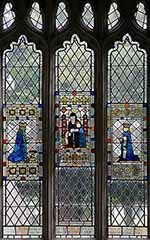 Introduction to Stained Glass: We show 8 windows, 6 of which date from the 20th century. 21 N Arcade (E) Single light with Roundel St Michael, the church's Patron Saint.